On 13 October 2001, Cessna 208B Super Cargomaster c/n 208B0906 was registered N102AN in the USA with AirNet Systems Inc, Columbus, Ohio. After being phased out by air cargo carrier AirNet Systems Inc, the aircraft went to the UK and was offered for sale by Aerodynamics. 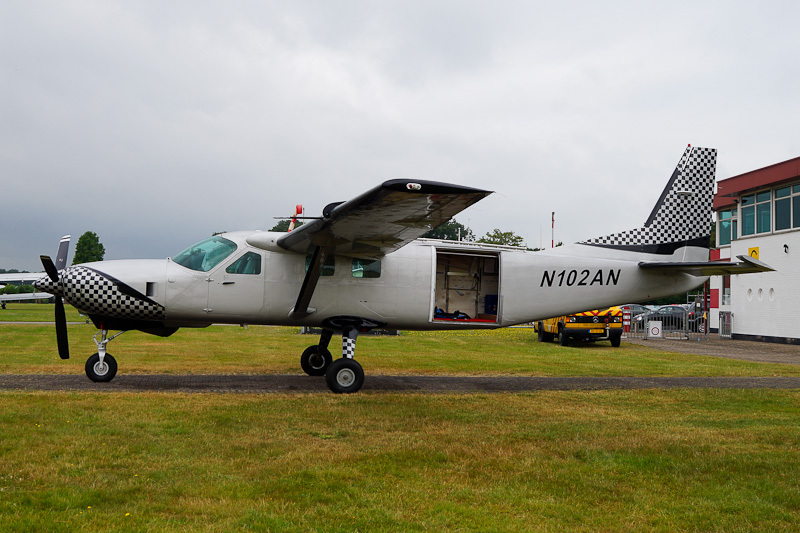 On 10 June 2016, the 2001-built Cessna 208B N102AN was registered with Turbo Aviation Inc Trustee, Wilmington, Delaware, as owner and the next day delivered to Skydive ENPC at Breda International Airport in the Netherlands. A trust is an Anglo-Saxon legal. Trustees like the Turbo Aviation Inc Trustee are “Insured fiduciaries". Legally there is no owner, but the Trustee became the owner. This construction is often used for enabling non-US Citizens to obtain "N" registration of aircraft with the U.S. Federal Aviation Administration (FAA) for aircraft operating principally outside the United States. Cessna 208B Cargomaster N102AN is operated out of Breda International Airport as a skydive platform by Skydive ENPC, Breda Airport. On 17 July 2016, the Skydive ENPC' Cessna 208B N102AN was seen at Breda International Airport just before dropping some skydivers.